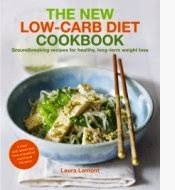 I was asked to review The New Low-Carb Diet Cookbook written by Laura Lamont. Laura Lamont is a qualified nutritional therapist. She heads up the diet coaching clinic Glow NutritIon Zero Foods in London, England, where she helps clients acquire healthy eating and weight loss skills. She has written for several lifestyle magazines including Woman, and is a diet specialist for Natural Health magazine. This is a new take on low-carb diets. Studies have shown that low-carb diets work! The success of the Atkins diet and other low-carb diets such as the Wheat Belly Diet and the Paleo Diet prove this. However, low-carb diets are difficult to stick with for the long haul and are often unhealthy. Lamont explains how eating a nutritionally sound combination of controlled amounts of complex carbohydrates, protein, and "good" fats (in foods such as avocados, salmon and flaxseed) at the right times of day can bring about healthy and long-lasting weight loss. Now there's no need to deprive yourself of any food group, and you don't have to give up bread! The first 39 pages of the Cookbook include information on the nutritional science behind the diet, as well as practical charts to help you identify which foods you should be eating and when. After the introduction to the plan and a five-day body preparation plan, it gives you ten Diet Tricks to follow. Meal plans are also included. Once you have completed your five-day body preparation, you will find more than 75 mouth-watering recipes for breakfasts, lunches, dinners and even desserts in this cookbook! Each recipe comes with a nutritional analysis and most recipes have a photograph of the dish so you can see what it is supposed to look like. I know when I am trying new recipes, I really appreciate having a picture of the end result. The New Low-Carb Diet has been successfully tried and tested, drawing on the latest scientific research. Having both the diet itself and the recipes together in The New Low-Carbe Diet Cookbook is a great way to begin 2015 on the right foot in a healthy way. Disclosure: Gail Mahoney personally has reviewed this cookbook. Gail received no monetary compensation for her review. Her opinion and thoughts are 100% her own and are unbiased. Your thoughts & opinions may differ. This sounds like an interesting book. I am glad that it explains I detail the science behind the diet. I didn't know that it made a difference at what time of the day one ate salmon or avocado.